When are the best, worst and most unreliable periods for pasture growth on your farm? Knowing the answers to these questions will help you make the right strategic decisions for your sheep enterprise. Manipulate pasture production and composition to meet the needs of your enterprise. To better understand your feed supply, construct pasture supply curves for your property and assess the variability between years. This requires knowledge of your annual rainfall and its variability, temperature patterns and your pasture types. Annual rainfall and its distribution influence pasture growth. To review your annual rainfall pattern, graph your own average, long-term rainfall figures, or to find long term rainfall information, visit the MLA Rainfall Outlook web site (www.mla.com.au/extension-training-and-tools/tools-calculators/rainfall-to-pasture-growth-outlook-tool/) or the National Agricultural monitoring System (www.nams.gov.au/) or Climate On-line web page at the Bureau of Meteorology website (www.bom.gov.au/climate/data/). If you use Climate On-line choose the “monthly statistics” option, then your state and closest town, and click the plot icon to graph your Decile 5 median rainfall as shown in figure 8.1. What does the annual rainfall pattern look like in your district? Can your existing pastures use the rain whenever it falls? Could pasture types with growth patterns different to those of your current pasture types fill some seasonal feed gaps in response to rain? Figure 8.1 Median rainfall at Dubbo NSW (left) and Kojonup WA (right). Dubbo sheep producers could grow green feed almost all year round in response to rain, but this is much less likely at Kojonup with winter dominant rainfall. On any farm there may be several different pasture and feed sources (annual pasture, native or introduced perennial grass pastures, lucerne, grazing cereals, forage crops and crop stubbles) that can provide forage at different times of the year. Figure 8.2 shows the growth of lucerne and sub clover based pastures at Dubbo. Your total farm feed supply determines how well an enterprise and stocking rate will suit your growing season. However, it is important to also consider the quality of the pasture at different times of the year. For example, only a small area of lucerne might be required to grow out late winter born lambs in the Dubbo region. There are several ways to use the pasture growth data. The first option is to plot on a graph similar to figure 8.2, the pasture growth of each of the main pasture types on your farm. This data together with information on the area of each pasture can be entered into the Feed Demand Calculator (see tool 8.3) to generate an overall supply curve for your farm. In addition, the tool allows you to trial different stocking rates, lambing times etc and determine pasture deficits or surpluses. Figure 8.2 Pasture supply curves for Dubbo, NSW. Summer active pastures can extend the growing season and provide land management benefits (see procedure 5.3 in Protect Your Farm’s Natural Assets). A second option is to manually work out the “average” pasture growth each month for your farm. See tool 8.2 for daily pasture growth estimates for common pastures by region. This is relatively easy where there are only 2-3 pasture types on a farm. For example, assuming that the data in figure 2 is from a 1000 ha farm with 800 ha sub clover pasture and 200 ha of lucerne, the average growth in January is: (lucerne 25 kg/ha/day x 200 ha) + (sub clover 5 kg/ha/day x 800 ha) / 1000 ha = 9 kg/ha/day average farm pasture growth in January. The same calculation can be undertaken for each month to determine the average pasture supply across the farm in an average year. Figure 8.3 Average pasture growth curves (1965–2002) for four different environments. Kojonup, WA: annual pasture, good fertility; Bendigo, Vic: phalaris/sub clover pasture, good fertility; Armidale, NSW: native pasture (red grass)/sub clover, low fertility; Dubbo, NSW: annual pasture, moderate fertility (from GrassGro®). A third thing to consider is the potential to use alternative pastures or forage sources to fill feed gaps. 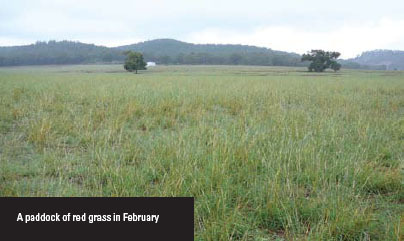 For the farm shown in figure 2, what options are there to graze cereals or use pasture growth promotents in July? Is there potential to use more summer active pastures to overcome feed gaps in summer? Local state agency staff or agronomists can provide advice on species to fill feed gaps. Procedure 7.3 in Grow More Pasture also provides details of where to get information on pastures for different areas. Finally, with the assistance of your consultant or adviser, use tools such as the computer model GrassGro® to get more specific data for your pasture species, soil types and soil fertility levels and how changes to these will influence pasture growth and quality. Pasture supply varies from year to year and between different locations. The variability of pasture growth between years is an indicator of risk and affects the ability to set an optimal stocking rate target or the reliability of a particular time of year for lambing (see figures 8.3 and 8.4). Figure 8.4 Variability in annual pasture growth rates for Kojonup, WA (from DAFWA Woolpro sites and Pastures from Space) and native redgrass/sub clover pasture, Armidale, NSW (from GrassGro®). In figure 8.4, Decile 1 represents the one-in-ten bad years (only 10% of all pasture growth records would fall below this line). Decile 5 represents an “average” year (half of the recorded years were above and half were below this line), while Decile 9 represents the boom seasons (90% of all pasture growth records would fall below this line) – only 10% of recorded year’s pasture growth would be above this year. The closer all three Decile lines are together in any one month, the less variability there is between years. In figure 8.3, the most reliable months are July-September at Kojonup. Autumn growth in annual pastures is variable at Kojonup, whilst spring is the most variable growth period for native pastures at Armidale. To better understand your feed supply, construct pasture supply curves for your farm and assess the variability between years. The simplest approach to constructing a pasture supply curve is to draw the growth curves for the main pasture types on a single graph. Use the relevant tables in tool 8.2 to construct simple pasture supply curves for your farm. The estimates presented are only intended as a guide to help plan your annual feed availability. As an example, a pasture supply curve has been constructed for Dubbo NSW (figure 8.2) using the tables in tool 8.2. Figure 8.4 Pasture supply curves for Dubbo, NSW. Summer active pastures in winter rainfall zones can extend the growing season and provide land management benefits (see procedure 5.3 in Protect Your Farm’s Natural Assets). The Climate on line web page at the Bureau of Meteorology website (www.bom.gov.au/climate/data) provides historical weather details. In this site click on “Weather & climate”, then “Monthly statistics”. Enter your location and select the nearest weather station to your location. Get the data and then select “All available” to see the Decile 1, Decile 5 and Decile 9 rainfall values. The data in tool 8.2. Alternatively, use tool 8.1 to calculate an index of potential pasture growth, based on actual rainfall, indices of soil moisture, pasture growth for the past nine months, and an outlook for the next three months. Use this tool to get a ‘feel’ for when to expect pasture growth; to establish where the likely deficits will be; and to identify opportunities to include different pasture types in your enterprise. Tool 8.3 (the MLA feed demand calculator), describes how best to match animal demand to your pasture supply, and minimise your exposure to risk from seasonal variability. The feed supply curve is generated as well as an inventory of stock demand across the year (all classes considering purchase, sale and lambing dates). Compare supply with demand to get a better understanding of when pasture will be in surplus or deficit and by how much. Use this information to set up your enterprises to better match available feed with animal demand. Rainfall, temperature, soil moisture, soil type, fertility and pasture type combine to drive pasture growth. You can’t change your annual rainfall without moving, but you can rethink your existing pasture types and management systems to suit your location and achieve your enterprise goals. Establishing new pastures (procedure 7.3). Supply gaps by can be filled in several ways. Use different pasture species and forage crops to provide out of season pasture growth. Figure 8.2 shows how lucerne can fill a pasture supply gap over summer/autumn in areas that receive summer rainfall. Lucerne and other deep rooted, summer-active perennials such as chicory can also prevent potential dryland salinity problems and protect the soil (see procedure 5.3 in Protect Your Farm’s Natural Assets). Nitrogen fertilizer can be used to boost pasture growth in winter and spring and is often more cost effective than using supplements. See Tool 7.4 Guidelines for fertilizer applications for more information. Supplementary feeds can also be used to fill feed gaps and harvesting hay or silage can also use some of the excess pasture available in spring. Ensure that the supplements that you intend to use are adequate for the class of stock being fed. The Grazfeed program (www.hzn.com.au/grazfeed.php) or information available through the Lifetime Ewe course can assist in making better use of supplements. Contributed 16% of the total feed requirement for the year. It is your total farm feed supply curve and its variability that indicates how well an enterprise might be suited to your growing season. Revisit your annual livestock management calendar (see procedure 8.2) and your business plan (tool 1.3 in Plan for Success) now that you know your feed supply and how it varies within and between years. It may be possible to address livestock needs with addition of other plant species to provide pasture of the quality and quantity required for the production goals (eg, growing out weaners, finishing lambs, etc). Alternatively, a more cost effective option is to revisit your enterprise structure (the number of breeders and trading stock carried), as well as reviewing your target market. For example, a better option in some locations without a summer feed supply, may be to sell lambs as stores, rather than taking them to heavier weights. Drought Publications – The AWI website has a series of publications on managing drought recovery. visit: http://www.wool.com/. 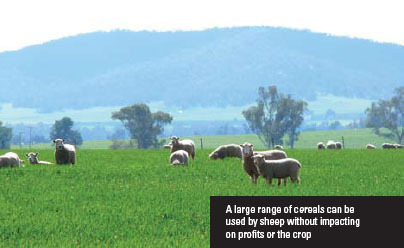 Click on for woolgrowers > Sheep Health, Welfare and Productivity > Sheep Nutrition > AWI Drought Resources. Drought Feeding Calculator: available for ios and Android. Develops a drought feeding strategy for sheep (and cattle) by determining feed requirements for different sheep age groups and pregnancy/lactation status.